The weekend began on Thursday evening with an official reception planned to take place at a Tapas restaurant on a boat on the river Loire, to welcome us and our German friends from Bad Brückenau, but as it was a beautiful evening this took place on the quayside. We were given a very warm welcome, Sangria and canapés were enjoyed by all and old friendships renewed. The remainder of the evening was spent with host families wining and dining with our hosts . Friday was a free day spent with the host families. 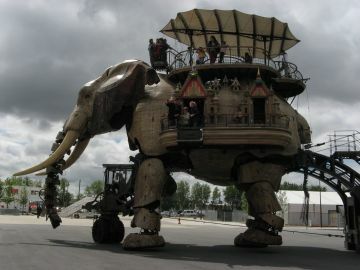 We were taken to the workshops of “Le machine' where the gigantic spider for Liverpool was made and this is the giant elephant that has also visited the UK. It was a fascinating visit and could possibly be a group visit for our next trip to France. 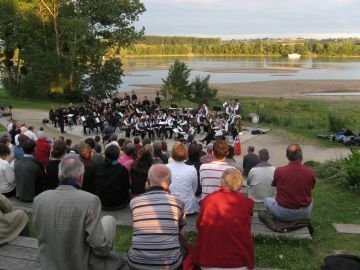 In the evening we had a concert by the French and German bands in the grounds of the Charbonniere overlooking the Loire. It was a beautiful evening and and such an idyllic setting and the music was wonderful. During the concert official presentations were made between the two bands. On Saturday morning the weather was perfect for a beautiful walk with the group along the shores of the Loire past a Neolithic settlement site to a local vineyard. 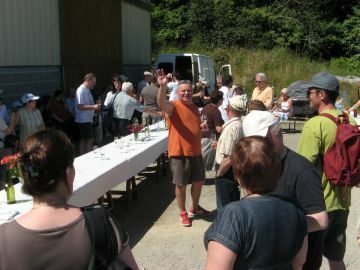 Excellent wine tasting and traditional pastries were welcome refreshments and there was a barbecue afterwards for the bands at the Charbonniere. 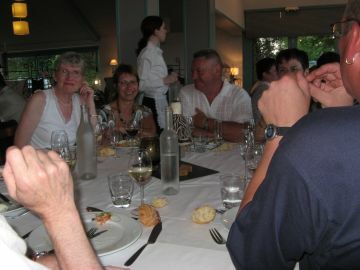 Saturday evening we were invited to an excellent four course dinner and a fine selection of French wines served at the restaurant at the Charbonniere and there were speeches and the usual presentation of gifts. A good time was had by all. On Sunday morning at 8am our German friends left for their long coach trip home. We spent the day with French friends, and in the afternoon we were taken to their children`s school`s Kermasse. (A bit like our school fetes)The children put on a show of traditional dancing and there were side shows and competitions and in the evening, a barbecue. It was lovely to see and take part in local traditions. A fitting ending to our stay in Ancenis and here’s to the next time!